1. To refrain from something by one's own choice: Congressman Adrian Tyler promised to abstain from traditional political rhetoric. 2. To refrain from voting: Forty-five senators voted in favor of the new health bill, forty-five voted against it, and twenty-five decided to abstain. Marked by restraint especially in the consumption of food or alcohol: Emily's mother was known as an abstemious eater and drinker who always had healthy meals for her family. Diana's midlife heart attack made her realize the importance of taking care of her body and so it turned her towards a more abstemious and healthful lifestyle. 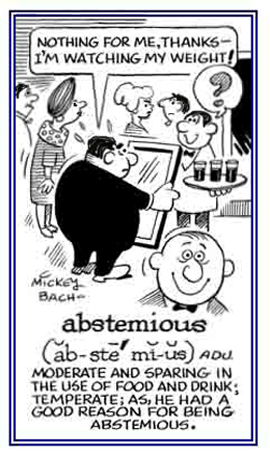 The terms abstain and abstemious seem to have similar formats and both have meanings involving "self-restraint" or "self-denial". Although they may appear to come from the same root and both of them start with the Latin prefix abs-, meaning "from" or "away"; abstain is traced back to abs- plus the Latin verb tenēre, "to hold"; while abstemious gets its -temious from a suffix related to the Latin noun temetum, "intoxicating drink". 1. Relating to being moderate or not excessive when eating and drinking; being sober, temperate; and not being too self-indulgent: Ted's family ate abstemious meals in order to cut down on their overweight conditions. Abstemious people restrict themselves to the bare necessities of life and prefer an austere, simple, or unassuming lifestyle. 2. Etymology: abs-, ab-, "from, away from" + temetum, "intoxicating drink, mead, wine". © ALL rights are reserved.